1.) 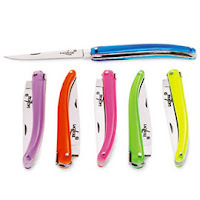 For the Urban Adventurer: This Pen Knife by Vivre is useful and stylish, for all those urban obstacles that may come his way, from opening a particularly difficult UPS package to slicing a ripe Brie, plus it comes in a variety of bright colors. 2.) For the Art Lover: Lucian Freud: The Painter's Etchings from the exhibition at MOMA, is the ultimate coffee table book. Freud's grandson's Egon Schiele-esque portraits are haunting, memorable, and sure to capture his interest. 3.) For the Man-Child: A set of polished stone building blocks from Leo Design enables him to create his own castle where he can be the king and momentarily forget that you're really the one who wears the pants! 4.) For the Product Hound: A product from Bigelow's new Barber line will satisfy his craving to groom himself in style, plus the products come in festive red bottles, perfect for the holiday. 5.) For the Businessman: Spritzing on Bond No. 9's Wall Street will make him feel right at home, even on his day off. It might also inspire him to pick up a little scented something for you too! As for my boyfriend, he'll just have to wait and see what he's getting for V-Day this year. Let's not forget that in the end it's really the thought that counts. What do you plan to give your significant other for Valentine's Day? A piece of toast cut in a heart shape and topped with raspberry jam, and a fossil in a rock with a card "love forever." Adorable van briggle vintage puppy dog bookends in raspberry glaze, of course. What gal could resist matching puppies? Hey Beauty, Love all your valentine suggestions. Any ideas about how to get my hottie to follow your suggestions, short of telling her to do what "Beauty" says? Regarding your question as to how to drop the hint, I would say that emailing her a link to my latest post might do the trick. If you want to be more subtle you could always leave the post up on the computer screen. When she goes to check her email it will be staring right at her! Tickets to a sports event that I know we'll both enjoy - that way we get to celebrate again in March when the even takes place! Are You a Snow White or a Rose Red?